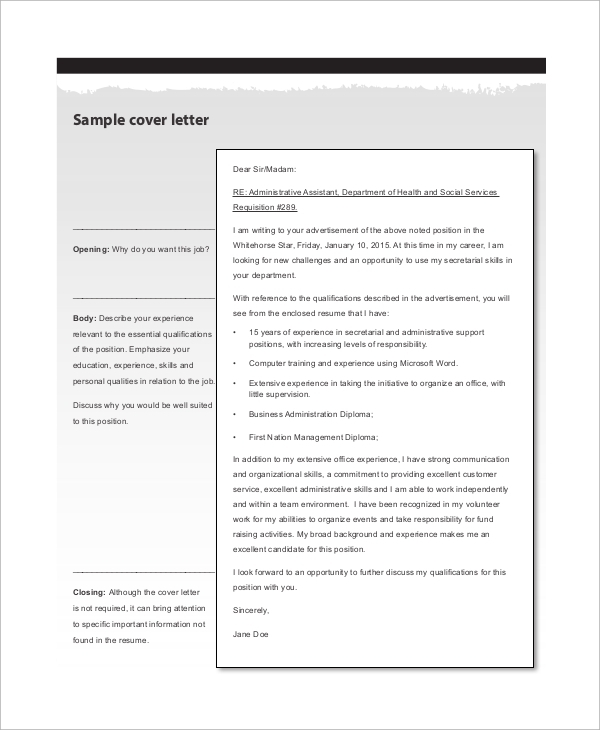 The administrative assistant cover letter samples are especially useful for helping you build a strong resume for the post. The cover letter is especially useful in holding valuable information, as well as supporting the resume with an excellent introduction. The administrative assistant post is a post with heavy responsibilities and a lot of work. Now if you have to project your resume better than other competitors, you must make a good cover letter. The Sample Cover Letters are shared here. 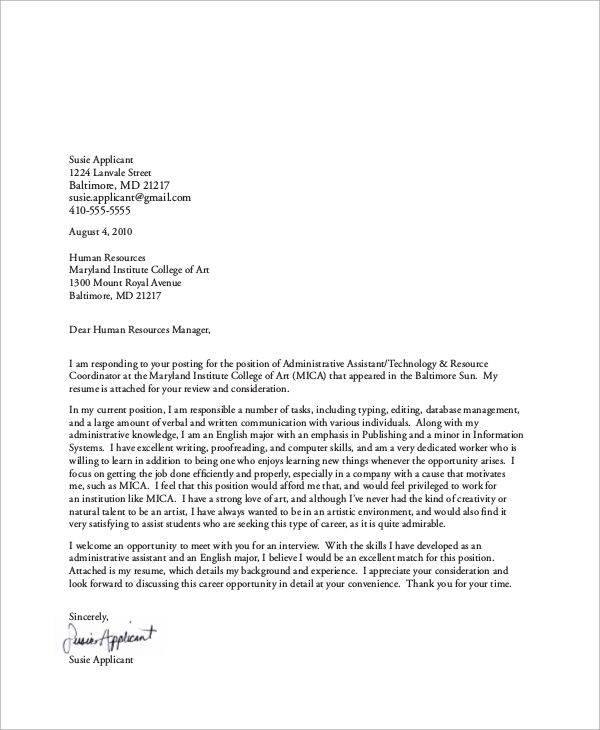 The administrative assistant cover letter example is a basic format of making a cover letter. 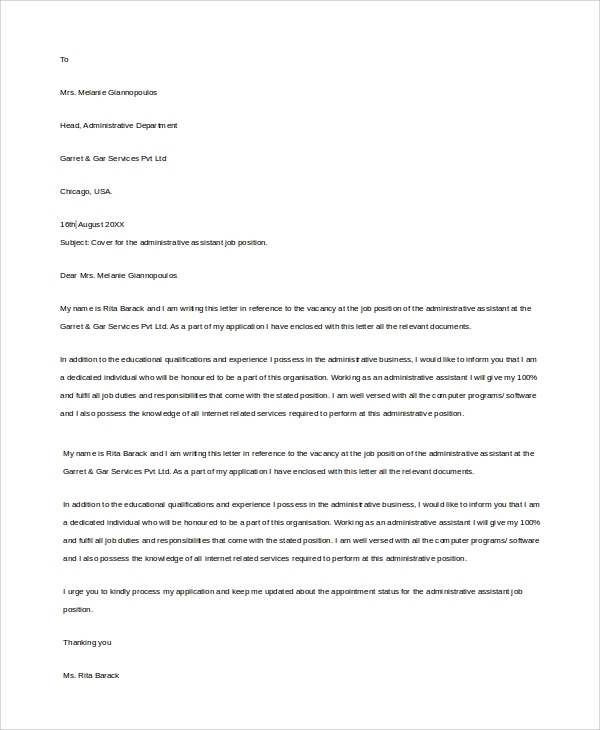 You may use this example to understand how the normal cover letter is written irrespective of the domain, and specific to the post. 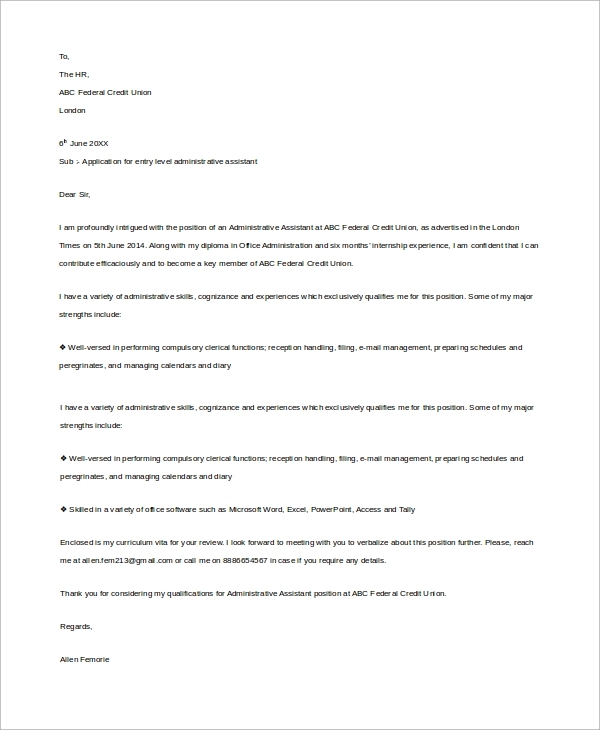 The resume cover letter for an administrative accountant is the one you would like to use while applying for the post with a most professional resume friendly cover letter format. This is an excellent sample of a cover letter and a perfect fit for the resume of an administrative assistant. Hence you should use this one for making an officially perfect cover letter. 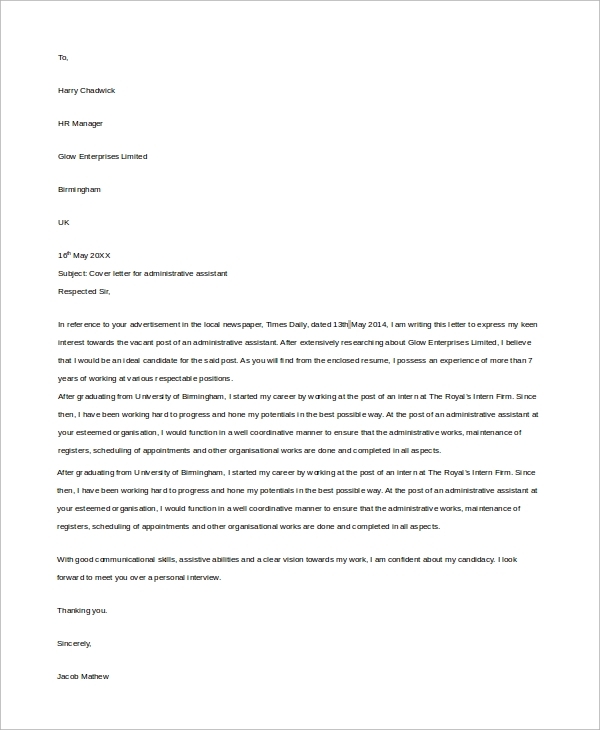 The cover letter for an administrative assistant job is a nice sample that you would like to use to apply for the right job type in the right way. You may download this now for free. 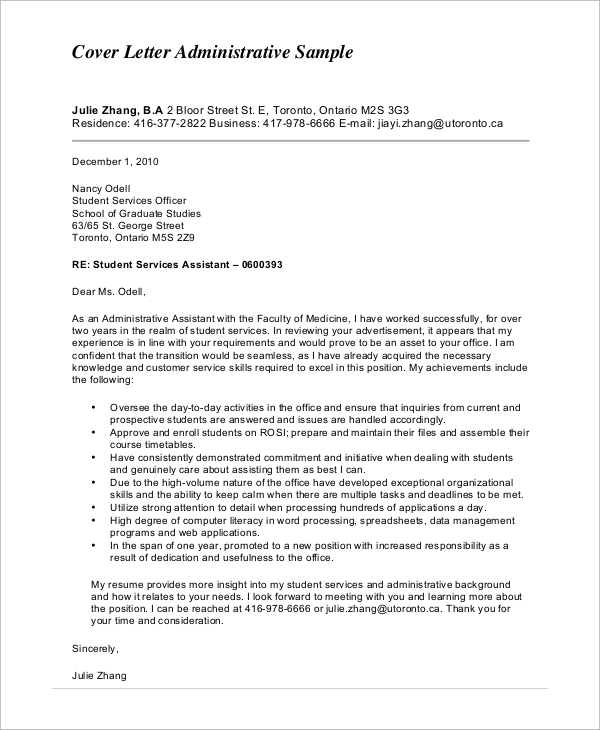 The cover letter for administrative service assistant is specifically designed for the service assistant post and it offers a great way to describe your resume in the most appealing manner. What Is an Administrative Assistant Cover Letter? The cover letter is an introductory letter that you should use to explain and introduce a matter. 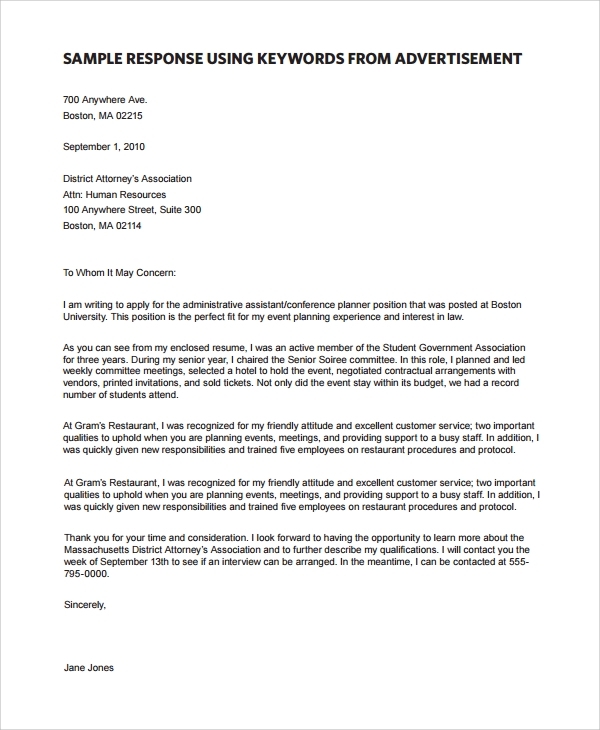 Here, for applying to the administrative assistant post or job role, you will need a Cover Letter Example that will properly introduce your resume and your candidature and tell the recruiter in short and simple words why you are the apt candidate for the post. Your cover letter is also a great tool to present the whole job application in the most competitive and official way, so that you may professionally impress the recruiter. It introduces your resume in short, and gives an overview of what you are, who you are, your past, and present and what you are capable of doing in future if you get the right opportunity. It also gives the most official display of use of language, and the best professional looks that might be needed to impress the recruiter. The cover letter is never a long document, but a short and precise, to the point composition of relevant facts in an impressive, catchy and yet official style to best describe your candidature. You can make a cover letter for the administrative job role quite quickly when you have a reference, and you may get more references and guides than usual one here online when you look trough the resources. Hence, you must try browsing through the sample Cover Letter Formats which are free to download and use for the best cover letter writing for the job role of an administrative assistant.